We’ve been exploring how brands are using the live music experience to connect with fans. And when I saw the footage of Snoop Dogg performing in the super-sized Doritos vending machine at SXSW I have to say that I wasn’t that impressed because it seems like it was just another lame attempt to only market to fans with a slick gimmick and not really add any value or innovation to the live music experience. But since then I have to say things have changed as I’ve experienced more of the interactive content that Taco Bell and Doritos are unveiling with their recent combined Locos Tacos campaign. As you can see by the photo above, the part about the Locos Tacos campaign that I have enjoyed the most is their excellent use of QR code. I’m geek when it comes to QR codes and this use is by far one of the most creative and well executed that I’ve seen so far. Taco Bell and Doritos have clearly taken the time to understand their audience right down to connecting the sense of taste sound and sight in a pretty solid interactive experience. Yes, I love how they made the double-fisted connection of having a Doritos Taco in one hand and in the other hand you’ve got the crafty copy and the live concert videos of Dale Earnhart Jr, Little Hurricane, Miniture Tigers and other bands. However, I do think this mobile experience could be improved. It could be more interactive and create a better sense of community among concert fans and ultimately put fans right at the center of an emotionally engaging, highly sharable, and extremely viral social media experience. For example, Taco Bell and Doritos could enable fans to tweet the similarities between their concert experiences and their Locos taste experience, and use those fan interactions to create a hashtag, Facebook page or even a unique forum community with other Locos Tacos/live music fans who are going through the same shared experience. What Have They Done This Year? And I see this as a possible future phase of what Taco Bell and Doritos has been doing with Augmented Reality and their $5 Big Box this year. So far in 2012, I’ve seen how they’ve experimented with other creative applications of Augmented Reality and their $5 Big Box. First they turned the Big Box into an interactive Street Fighter video game, which I was addicted to playing while I stuffed my face with tacos. 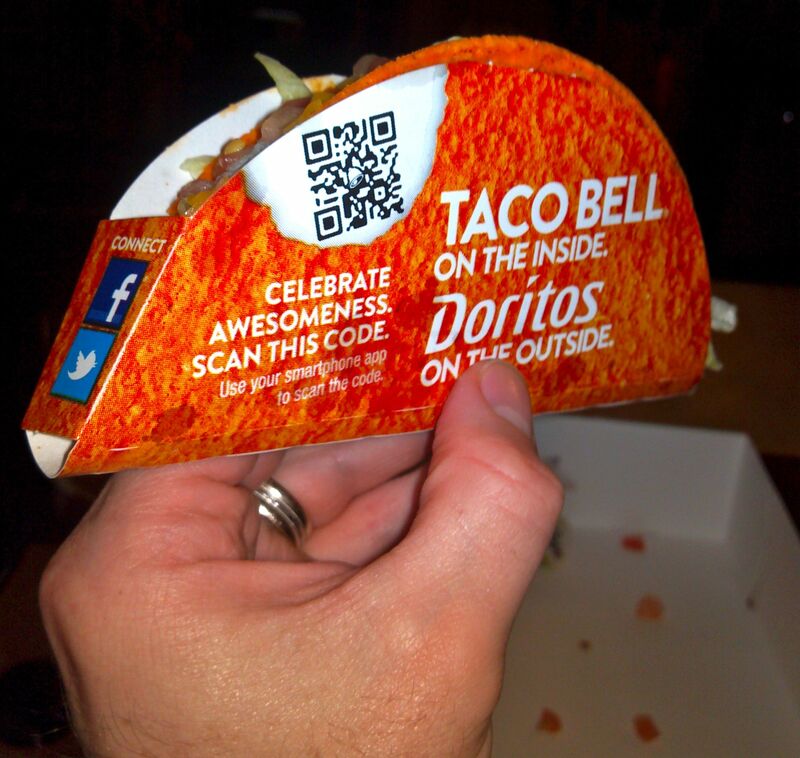 And then right around the time of SXSW came the next phase which involved buying a Locos Tacos Big Box that you could scan the box with your smartphone and see an AR floating cloud of interactive tweets from other customers who’ve enjoy the tacos too. And then while you’re munching and crunching you can join the cloud and tweet your own taste raves too. Again, this all very fun and creative. But what they should do is capture the live concert experiences of fans who are at these sponsored Taco Bell/Doritos shows and turn those tweets into a interactive game of shared concert stories. That way fans are not only sharing the awesome taste of the Locos Tacos but they’re also sharing what their feeling during the show. Combined together these two highly emotional experiences would be extremely powerful. And, like we’ve said before, this type of combined emotional interactive experience is a win for fans and a win for the brands. Who knows, maybe this or some form of this idea is already in the works. Have you used tasted and experienced the combined pleasure of the Locos Tacos and live music? What do you think of their use of AR and creative branding? What are your favorite examples of great uses of QR codes for live music fans? Share your concert stories and thoughts in the comments below, on Twitter @livefixmedia, on Facebook , Google Plus, or call the concert fan hotline at 773-609-4341, and we’ll include them in a future episode of Live Fix Radio.